Hi-res press photos from Word for Word's Fall 2013 production, In Friendship by Zona Gale, at Z Below 8/14 through 9/8. Nancy Shelby as Mrs. Postmaster Sykes.Mrs. Postmaster Sykes considers her next move.Photo credit: Mark LeialohaWord for Word's 20th Anniversary production In Friendship, A comedy of American manners by Zona Gale. 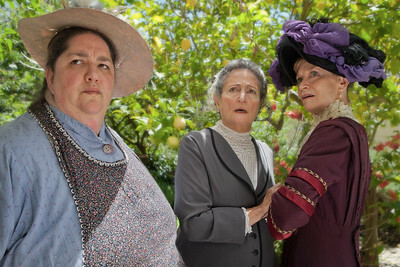 L-R JoAnne Winter, Jeri Lynn Cohen, and Stephanie Hunt as Viny Liberty, Calliope Marsh, and Libbie Liberty.Calliope persuades the Liberty sisters to join her Thanksgiving scheme.Photo credit: Mark Leialoha Word for Word's 20th Anniversary production In Friendship, A comedy of American manners by Zona Gale. 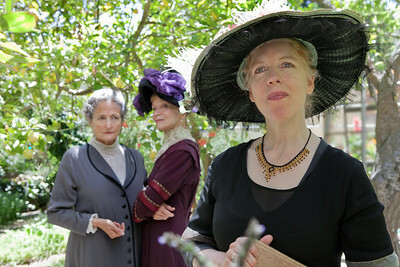 L-R Amy Kossow, Patricia Silver, and Nancy Shelby as Mrs Toplady, Mrs. Mayor Uppers and Mrs. Postmaster Sykes. The ladies are scandalized. Photo credit: Mark Leialoha Word for Word's 20th Anniversary production In Friendship, A comedy of American manners by Zona Gale. L-R Patricia Silver,Nancy Shelby, and Stephanie Hunt as Mrs. Mayor Uppers, Mrs. Postmaster Sykes and Mrs. Oliver Wheeler Johnson. They do not like her hat.Photo credit: Mark LeialohaWord for Word's 20th Anniversary production In Friendship, A comedy of American manners by Zona Gale. 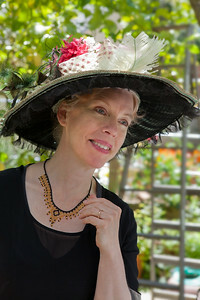 Stephanie Hunt as Mrs. Oliver Wheeler Johnson. In Friendship.Photo credit: Mark Leialoha Word for Word's 20th Anniversary production In Friendship, A comedy of American manners by Zona Gale. 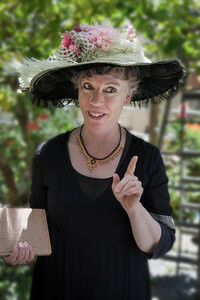 Stephanie Hunt as Mrs. Oliver Wheeler Johnson. Mrs. Johnson is excited about making new friends. Photo credit: Mark Leialoha Word for Word's 20th Anniversary production In Friendship, A comedy of American manners by Zona Gale. 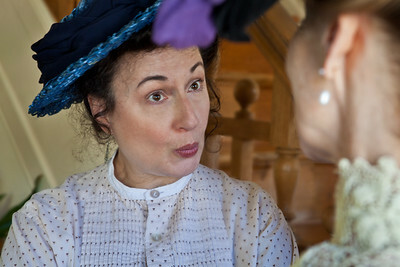 Jeri Lynn Cohen as Calliope Marsh.Calliope speaks her mind.Photo credit: Mark LeialohaWord for Word's 20th Anniversary production In Friendship, A comedy of American manners by Zona Gale. 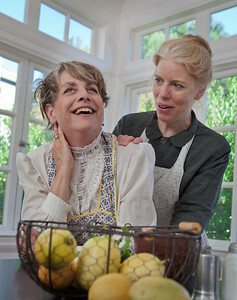 L-R JoAnne Winter and Stephanie Hunt as the Liberty sisters. The LIberty sisters plot the making of the Sunshine Cake.Photo credit: Mark LeialohaWord for Word's 20th Anniversary production In Friendship, A comedy of American manners by Zona Gale.